Winter asks us for nourishment, rest and clarity. It is a time for reflection, for going inward, for planting seeds. As we journey within this dark season, we begin to slow our pace, and (hopefully) honor the nourishment and rest we have needed all year. In winter the sky is cloudy and the weather is damp and heavy; life seems to slow down altogether. In Ayurveda, Winter is considered to be elementally cold and dry, and generally a season of Kapha. In order to create balance within ourselves throughout this season we need warmth and nourishment. This means we need to infuse warmth and nourishment into all aspects of our lives, tending to our wholeness -- our body mind and spirit. For me, slowing down means taking more time to listen deeply to my body. To reconnect with my natural rhythms and to take more time to practice self love and self care. It means staying home and knowing when to say no. It means journaling more; planting seeds to gestate in the dark soil until the return of the sun. It means nights in front of the wood stove, a good book (or several!) and a cup of my favorite herbal tea. It means broth, soup, stew and all the warming nourishing foods I can eat. It means candlelit baths and aromatic resins. It means all things cozy and rejuvenate. Sesame oil is warming extremely nourishing to the nervous system and penetrates deeply into the tissues.Apply oil always following the path of the lymph towards the heart, rubbing the oil deeply into the skin. Remember, a little goes a long way here! By covering our body in oil in the morning, we are calming and grounding our nervous systems, bringing deep nourishment to the tissues of the skin. Taking a hot shower afterwards to seal in the warmth. A hot aromatherapy bath before bed can relax your mind and your muscles. Add 1 cup of Epsom salts and 5­ drops of pure lavender essential oil to your tub of hot water. SOAK away your day’s troubles. Lavender promotes relaxation and sleep and brings an overall sense of wellbeing. This can be done nightly just prior to going to bed to help wind down and warm the body before a good night's rest. warming and tonifying herbs are such potent allies for this season! 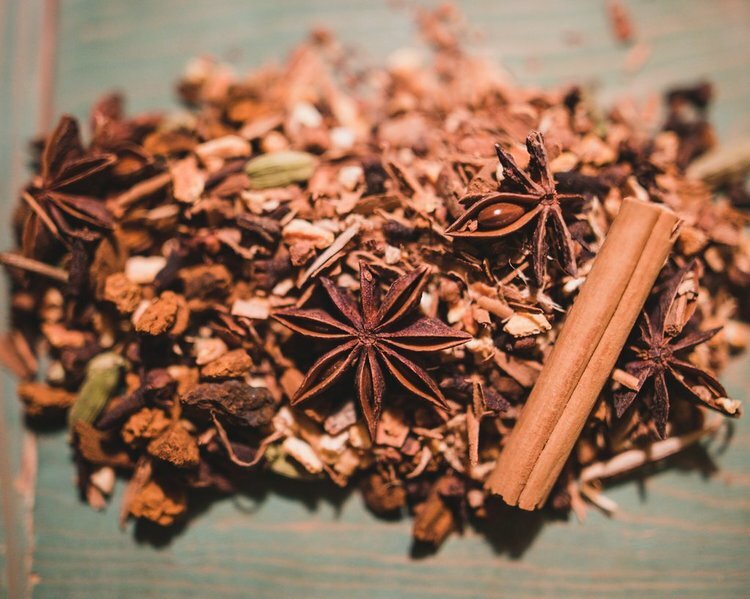 Warming herbs and spices, also known as carminitives, help stimulate good circulation as well as bring warmth to the core, helping us to stay warm; not to mention they help facilitate healthy digestion and elimination too! Tonic herbs bring about deep nourishment, supporting our adrenals, nervous systems, our body’s vital reserves. They also support our liver and healthy detoxification. For leaves and flowers I usually make a hot infusion by pouring boiling water over ¼ cup dried herbs, covering (to keep in all of those good aromatic & volatile oils from escaping!) and steeping for at least 20-30 minutes before drinking. For roots and barks, seeds and berries I make a Decoction, which is a slowly simmered tea which extracts the medicinal properties from the plant material. 1. Take 1 cup dried roots, seeds or berries and cover with one quart of cold, filtered water. 2. Slowly heat the water to a simmer and cover. 4. Strain the liquid into a jar and enjoy! Store any extra in the fridge for up to a week! My favorite way to make this delicious chai is to keep a weekly batch going on the top of my woodstove! It saves energy, keeps at a perfect simmer decocting my herbs low and slow for a long time making sure to get the most out of them and not to mention it’s such a lovely ritual to tend to the fire and my chai at the same time! If you do not have a wood stove, a crock pot or the stovetop will work too! I hope you will honor the slow tempo of the winter season, and find time to nourish yourself in the midst of this busy holiday season. Elemental nourishment allows us to find balance season by season, tending to our bodies minds and spirits accordingly. It reminds us that healing is elemental and balance can be achieved by deeply listening to where our bodies are at. May we honor the darkness of these days leading up to Solstice, and take time to deeply nourish ourselves.